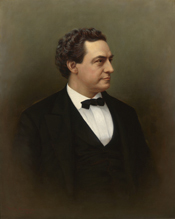 RANDALL, Samuel Jackson, a Representative from Pennsylvania; born in Philadelphia, Pa., October 10, 1828; attended the common schools and the University Academy in Philadelphia; engaged in mercantile pursuits; member of the common council of Philadelphia 1852-1855; member of the State senate in 1858 and 1859; served as a member of the First Troop of Philadelphia in 1861 and was in the Union Army three months of that year and again as captain in 1863; was promoted to provost marshal at Gettysburg; elected as a Democrat to the Thirty-eighth and to the thirteen succeeding Congresses and served from March 4, 1863, until his death; chairman, Committee on Appropriations (Forty-fourth, Forty-eighth, Forty-ninth, and Fiftieth Congresses), Committee on Public Expenditures (Forty-seventh Congress); Speaker of the House of Representatives (Forty-fourth through Forty-sixth Congresses); died in Washington, D.C., April 13, 1890; interment in Laurel Hill Cemetery, Philadelphia, Pa.
House, Albert V. The Political Career of Samuel Jackson Randall.'' Ph.D. diss., University of Wisconsin, 1935.